When it comes to discussing plans to get humans to Mars, the focus is often on the rockets and technology required to get there. Less attention has been paid to another component critical to the success of future missions: the crew member. That is until now. 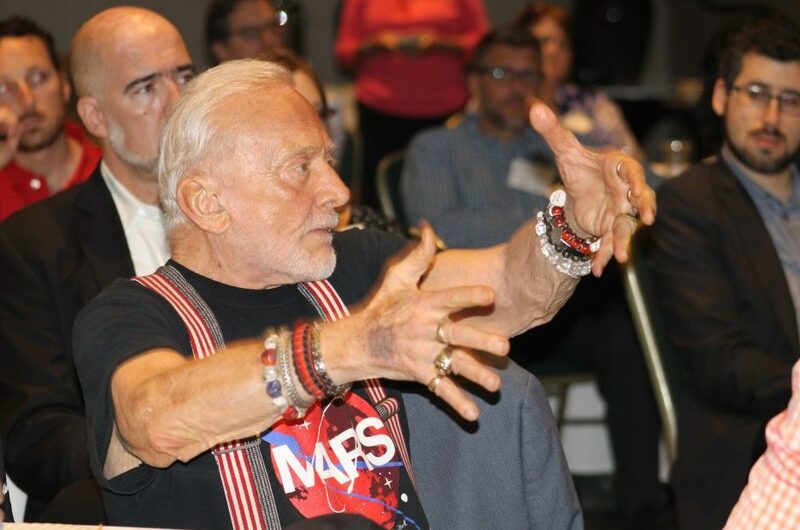 On May 30-31, researchers from across North America gathered at Kennedy Space Center Visitor Complex for the Mars Mission Social Sciences Workshop co-hosted by Florida Institute of Technology’s Buzz Aldrin Space Institute and its Institute for Cross Cultural Management. The two-day event brought together leading scholars from a variety of social science disciplines to develop common characterizations of the psychological, sociological and human performance challenges associated with permanent Mars colonization, and to consider the approaches and research needed to cope with these challenges. On Tuesday, Andrew Aldrin, director of the Buzz Aldrin Space Institute, welcomed the gathered researchers before turning the podium over to BASI founder Buzz Aldrin, pictured above and below, center, who shared his personal vision for getting humans on Mars and living there permanently. The workshop featured social science presentations based on overarching topics such as psychiatric health and disorders; group and team dynamics; international and cultural issues; human factors and human-centered design; and historical, sociological, and anthropological perspectives on colonization. Human-Centered Design for Potential Mars Missions. Guy Boy, Dean of the School of Human-Centered Design, Innovation and Art presented his case for considering human needs first as technology and organizations are developed for future Mars missions. Modeling and simulation along with interactive media are new engineering tools that can be applied to making new aerospace technology comfortable, efficient and intuitive, he said. Extremely Stressed and Extremely Bored: Team Self-Maintenance in Long Duration Space Exploration. Wildman, who is also an assistant professor of psychology, presented a talk exploring the mundane team functions that affect team performance and mission success and introduced the construct of team self-maintenance in the day-to-day effort to sustain psychological well-being and overall team performance. Predicting Individual Resilience for Long Duration Space Flight. Meredith Carroll, associate professor of aviation human factors, said it’s critical that astronauts are carefully selected to perform under stress. Research suggests it may be possible to predict an individual’s resilience to stress based solely on baseline, non-stressed physiological/psychological assessments. The second day was centered around small, multidisciplinary working groups focused on developing research agendas within the various sub-topics identified during the first day, and it concluded with formal brief-backs from each working group to wrap up discussions and plan next steps. Wildman added, “The intended final product of the workshop is a research agenda report that is truly integrative and interdisciplinary.